Last week the advertising agency Campbell-Ewald, which had the Chevrolet account for almost 90 years, announced they were relocating to Detroit from Warren, an inner-ring suburb whose mayor recently claimed is a "cleaner and safer city" than Detroit. Warren Mayor Jim Fouts said he was "blindsided" by the announcement. "It's a disappointment. It's a setback. It's not a devastating loss," [Fouts] said, noting that the city is gaining some jobs from GM and a new Super Walmart slated to open later this year. More than 600 of Campbell-Ewald's employees are expected to make the move into the old J.L. Hudson warehouse space in Ford Field, and the remaining 100 employees will stay in the building CE owns in Warren. The agency was actually located in the city until 1978 before moving to Warren. The re-re-location may be striking to a mayor who doesn't subscribe to the notion that a region needs a strong urban core. But the move is definitely consistent with what's taken place downtown over the past few years. More than 10,000 jobs have been brought to the area. Detroit's finances are a disaster, the city's murder rate spiked in 2012, and things, for the most part, seem pretty bleak. Yet businesses, carrying hundreds of employees, are moving into the city's core and this worries some people in the suburbs. He begins his piece by clarifying that, yes, if someone floated that idea a couple decades ago everyone atop the glorious hills of suburbia would have busted out in a collective hearty chuckle. Oh, shucks, Detroit? HA! Campbell Ewald’s decision to move back to Detroit from Warren, announced on Wednesday, may mark a sea change in Metro Detroit economic development. The relocation was a bold move for the marquee advertising agency, but it also reveals a new way of thinking among Detroit area business owners and CEOs. How bold! CE goes... where it went before! CEO of CE Bill Ludwig was quoted as saying the decision was a "cultural" one, not one that was financially driven. Translation: I don't want my workers to have to look outside at parking lots and chain restaurants anymore. With Ludwig's context in mind, imagine yourself a junior copywriter at an advertising agency. Would you feel inspired looking out the window at this? How lovely! A road. Perhaps after coughing up some copy I could walk to the Olive Garden, Buddy's Pizza, Old Country Buffet, or Applebees on my 30-minute lunch break because nothing else is really here. Awesome. So, Selweski wonders, has Detroit "snuck past" the suburbs and gained the upper hand in attracting businesses, jobs, and, worse, people? Our suburban officials need to devise a strong defensive strategy – an attractive counter-offer — to address this trend. A region needs a strong core to thrive. A region cannot — and will not — thrive if every tiny municipality in the region seeks to duke it out with one another over jobs [see: metro Detroit]. Detroit, although not the regional driver it could be, is where it needs to be. 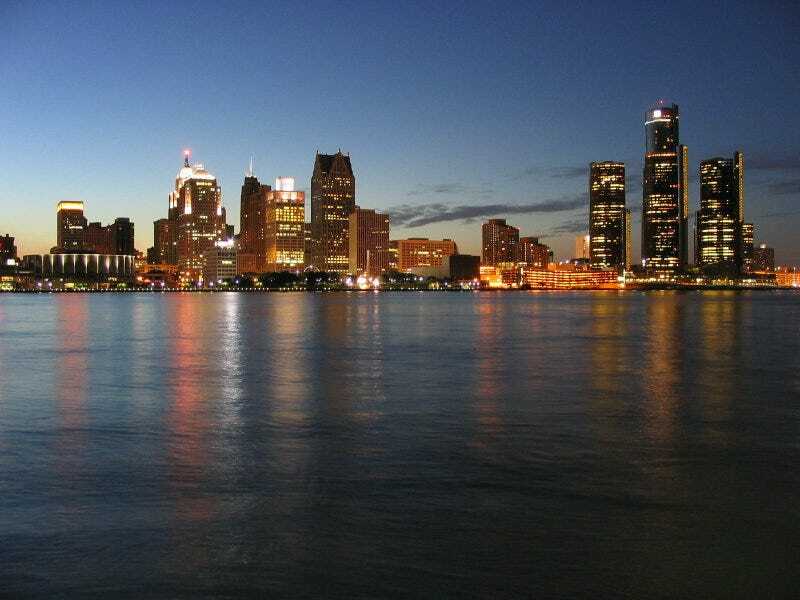 Detroit attracting its suburbs business, and not new out-of-state businesses, isn't a bad thing. Regionalism is going to be necessary for Detroit to experience any sort of real, visible turnaround, and when it does happen, the effects on the region will be visible and most likely profound. The researchers examined population changes in census tracts within 180 metro areas, noting the location of tracts that gained or lost population – and by how much – in the 1980s, 1990s and from 2000-2010. The numbers speak volumes: Detroit's population has plummeted from a high of 1.8 million in the 1950's to where it stands today — somewhere above 700,000. If Detroit has in fact finally started to reverse the decades-long exodus of its population, as Sewelski suggests, then it's a bit bizarre to call for a full-on "defense strategy" from the suburbs to prevent more CE instances. "If a bankruptcy hits, then all hell breaks loose... That's what could happen in a federal bankruptcy for the city — Wayne, Oakland and Macomb tapped to help the city, which I would be infuriated because why are you tapping me to help Detroit when they won't help themselves?"